They came to Charlton in their thousands, they're going home as champions! Twenty four years on from Bootham Crescent - where goals from John Deary and John Francis in victory over York City earned Burnley's last title in the old Fourth Division - the Clarets were promoted to the Premier League as champions. On an afternoon of protestation and celebration at the Valley it was striker Sam Vokes's 20th minute goal that sealed the deal, just days after the Welshman had secured promotion against QPR at Turf Moor. Among the pandemonium - with paper aeroplanes, toilet roll, gas cannisters and balls the supporters' disruptive tools of choice as they aired their objection to owner Roland Duchatelet's role at the club - the visitors started well as Vokes side-footed in to the travelling fans after Matt Lowton and Scott Arfield combined. Sean Dyche's side pulled holes in the home side's defence moments later and were almost rewarded with the opening goal but Andre Gray fired in to the side-netting with his left boot after cutting past Morgan Fox. But it wasn't long before Vokes netted goal number 16 of the season, sending the Clarets well on their way to a post-war record of 23 games unbeaten. Stephen Ward and Arfield worked the one-touch approach to good affect and when the latter supplied the delivery Vokes couldn't miss from close range. However, after Gray shaped an effort over the bar once Alou Diarra gave the ball away cheaply, the hosts grew in to the game. Johann Gudmundsson tested Tom Heaton to his left as space opened up on the edge of the box and the Clarets skipper then gathered Callum Harriott's attempt from distance. They were saves that you'd expect the England international goalkeeper to make, but there was nothing 'routine' about his next stop. Icelandic international Gudmundsson couldn't do much more when hitting the target from 20 yards out but Heaton sprawled to his right hand side to turn the ball around the upright with a strong hand. After Dean Marney fizzed an effort in to the side-netting, the Clarets stopper then came out on top again. Gudmundsson's pass mounted the attack, Ademola Lookman squared to an unmarked Harriott but the winger failed to find the net. And Heaton denied Addicks skipper Jordan Cousins in the final action of the half. 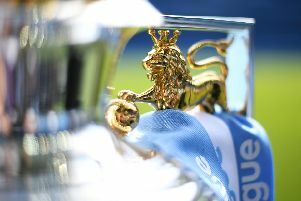 Before the fixture the FA confirmed that the Clarets wouldn't be presented with the Championship trophy in the aftermath. Instead, the club would be presented with the silverware - held by the likes of Jimmy Robson, Jimmy McIlroy, Jimmy Adamson and John Connelly in 1960 - at a Civic reception at Burnley Town Hall on Monday. But it didn't prevent the hosts from staging a ceremony of their own. At half-time the club's Under 21s were presented with their trophy and winners' medals for their success in the Professional Development League Two Southern Group. That controversy didn't dampen the spirits of fans, players, management and staff though. In fact it seemingly galvanised those onfield as quickfire goals from Boyd and Gray secured the points. Boyd smashed the ball past Nick Pope from close range from Stephen Ward's delivery just four minutes after the restart before Gray tucked the ball between Pope's legs when latching on to a long ball forward. The protests continued throughout the second half, with a pitch invader causing a momentary stoppage, but the day belonged to 2016 Championship winners Burnley.